how cloth has inspired them. Welcome to The Freedom of Cloth Carnival Melissa of The New Mommy Files, and me – Shannon aka The ArtsyMama from The Artful Mama with The Natural Parents Network. Wow, that was a mouthful. 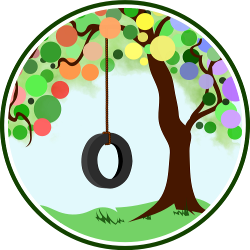 When Melissa approached NPN’s volunteers about this carnival idea, I was on board before her fingers left the keyboard. Having discovered the love for cloth, I try to let everyone I know and some that I don’t know (yet) about the awesomeness of cloth. Being a part of this carnival has been the perfect extension of my life with cloth. I use cloth, I talk cloth, I live cloth, I sell cloth. While I am not one of the wonderful WAHMs we are going to highlight in our carnival with reviews and giveaways, I am a Diaper Consultant with Everything Birth, Inc., and I occasionally dabble with my serge machine and a pair of scissors (that is when I’m not caring for Little Man or teaching about the wonders of drafting, painting or photography). My point with this paragraph is to let you know how very little time you need to make your own reusable cloth diaper liners. I started making my own liners out of necessity when I went on a week long cross country trip with my family and forgot my flushable liners at home. I called ahead to where we were going and tried to find a cloth diaper store or my disposable liners anywhere. I had no luck, but I was able to have my brother pick up some cotton flannel receiving blankets. I figured I could cut them down and toss them if I wanted to after the week. I took each of the blankets, washed them, and then ripped them into strips that looked about the length and width of my regular liners. 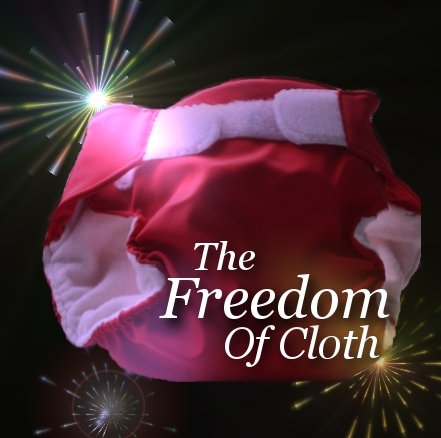 I used them that week and was so pleased not to have to dunk and swish my entire diaper but just a small swatch of fabric. I was hooked, because here again was another way for me to lessen the impact of my diaper use on the planet and my wallet. When I got home I saved the scraps of fabric and reused them until the edges frayed and then tossed them. The next time I decided that I was going to try to make them last longer and decided to dust off my serge machine. Now I never have to buy disposable liners again, and neither will you. 1. Take any old or unwanted cotton receiving blankets and wash like you would wash to prep your diapers. Use a very small amount of cloth diaper safe detergent and rinse thoroughly. 2. Fold the blanket up evenly into the size liner you would like to make and press with an iron. 3. 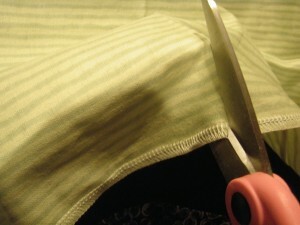 Unfold the blanket and using scissors, snip the edge of the blanket on one of the creases you have created. 4. Tear the blanket the rest of the way down the crease. If your blanket was not originally cut properly you may have to cut the blanket down the creases yourself so as to minimize waste. 5. Once the pieces are cut to the proper size you can either use a serge machine like I did or a regular sewing machine with a zig-zag stitch and stitch around all the edges. You can leave the edges unfinished but you will likely only get 4-5 uses out of each liner. 6. 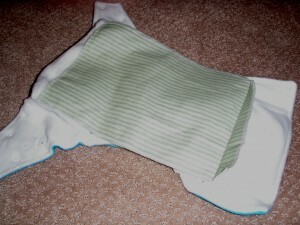 After you have sewn all four sides, snip the excess thread and you are ready to lay your diaper liner in your first diaper. 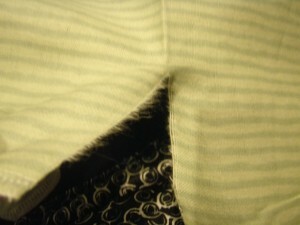 Cut through the edging to the fabric about 1/4"
Detail of finished edge. 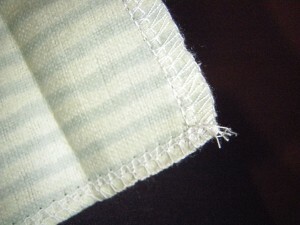 The tighter stitch is the manufacture edge. Thanks for a great tutorial, Shannon! I really am amazed that you find the time. One these days I may just take up sewing and give these a try! I’m curious, is it better to tear than to cut along the seam? Why is that? You will find these so easy to make. @Zoie – the reason for ripping the fabric is so you use a straight piece of fabric. Handsewn pieces will use this technique which is why they typically last longer. 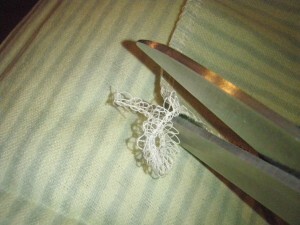 When you cut a piece of fabric instead you may be getting different weaves and it will be more likely to unravel. Great idea, thanks for this. I turned the majority of my recieving blankets into wipes! 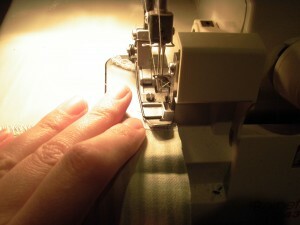 @Adrienne – I used the same basic principle when I was making fitted. @Randi – I did some of those as well. I love how versatile upcycling cloth can be. You rock 🙂 We used commercial disposable liners with Kieran, but I promise to give this a try with #2!